LIVERPOOL manager Jurgen Klopp says there are no problems between want-away Philippe Coutinho and the club ahead of tonight's blockbuster English Premier League clash with Manchester City at the Etihad Stadium. Coutinho returned to training this week after failing to get a move away from Anfield in the transfer window. 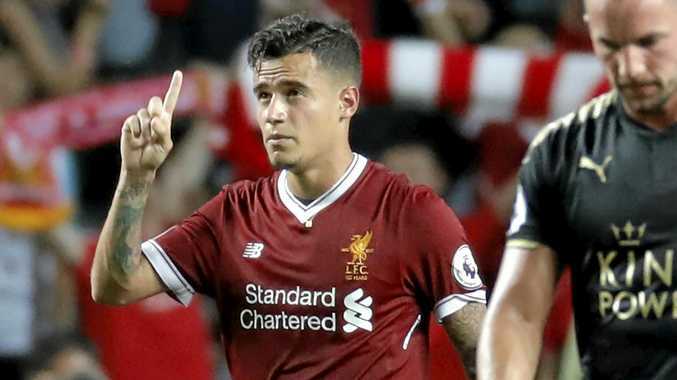 The Brazil playmaker submitted a transfer request on the eve of the season but Liverpool repeatedly rebuffed Barcelona's attempts to lure him to the Camp Nou. Coutinho has not played a game for the Reds this season citing a back injury, but he did play a part as a substitute for his country in two World Cup qualifiers against Ecuador and Colombia, scoring in the first game. Klopp said there were no hard feelings on either side and there was a possibility he might see some action against City. "Of course, all good, all good. Nothing else to say, actually, so he's back and we had a really good conversation, so good," the German said. "We always have the same decision to make: does he need training or can he play and all that stuff. "Yes, he will now do a little bit more than the other boys but he showed up in a very, very good mood and looks really promising." Coutinho returned home via private jet on Wednesday with club-mate Roberto Firmino, Manchester City trio Ederson, Fernandinho and Gabriel Jesus and Chelsea's Willian. Barcelona had tried to capture Coutinho after countryman Neymar's move to Paris Saint-Germain in a world-record deal. It was reported a board member from the Catalan giant said Liverpool had set an asking price of $239 million for the midfielder. But the English club responded refuted the claim and a spokesman was quoted on the BBC website as saying it was "absolutely false". Liverpool is in second place in the EPL behind Manchester United after two wins and a draw from its first three fixtures.